I've been thinking a lot lately about what truly makes me happy. Of course there are the obvious things like family, friends, being engaged in work that I enjoy and knowing that the decisions I am making are in line with the course I want for my life. But something unexpected crept up - Money! This lead me to wonder if I'm somehow evil, since, of course, money is the root of all evil. You've heard the old saying "Money is the root of all evil". Well, it actually goes like this: "The love of money is the root of all evil." Money itself is not intrinsically bad. Money can be used for good or bad. Its when we lust after money that problems begin. Why do I bring this up? Well, I don't think I love money, but, I do love the security that earning money brings. When I earn money, I feel like I'm doing my "manly" duty to support my family. So does this count as a bad desire? Somehow I don't think so. As long as it doesn't compromising my morals or drive me into spending inordinate amounts of time earning money, sacrificing essential or other important things. Are you in love with the root of all evil? [evil voice] Muuwaaa ha ha haaaa! Let CalendarBudget tame the number of the beast! P.S. 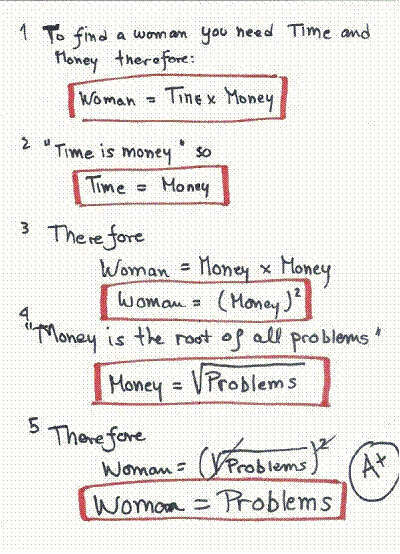 I found this clever math equation that proves (using the principle that money is the root of all evil) that women are problematic... funny stuff! The following joke satirizes the problem of focusing on possessions/material things while disregarding the more important things in life. Hopefully your perspective is better than this! A very successful lawyer parked his brand-new Lexus in front of his office, ready to show it off to his colleagues. As he got out, a truck passed too close and completely tore off the door on the driver's side. The lawyer immediately grabbed his cell phone, dialed 911, and within minutes a policeman pulled up. Before the officer had a chance to ask any questions, the lawyer started screaming hysterically. His Lexus, which he had just picked up the day before, was now completely ruined and would never be the same, no matter what the body shop did to it.When the lawyer finally wound down from his ranting and raving, the officer shook his head in disgust and disbelief. "I can't believe how materialistic you lawyers are," he said. "You are so focused on your possessions that you don't notice anything else." "Oh no!" screamed the lawyer. "Where's my Rolex?" Food is a must buy for everyone. We often fall into bad habits at the grocery store which end up costing us lots of extra money in the long run. Here are some ideas to consistently save you money at the grocery checkout. Some of these ideas are taken from a great article (Fifty ways to save on groceries) from the Toronto Star on Aug 23, 2007. If possible, grocery shop at a quiet time so you can compare prices. Tuesdays and Wednesdays are best. With meat, figure cost per serving instead of cost per pound. A pound of ground beef or boneless meat will make more servings than a pound with a lot of bones or fat. Look beyond eye level on the shelves. Manufacturers pay for this prime space. Look high and low for comparable items. I found this very interesting article from StatsCan (from Jan 2007) on the differences in trends between US and Canada regarding Personal Debt. Its a great read. Take a few minutes and give this 7-page document a read. Where do you fit in with the trends? There are certain purchases you deem are NECESSARY things to buy. For us, one of those things was a vehicle. We had to purchase a new vehicle before we got married because my previous vehicle had, how shall I say it..., "given up the ghost". After we were married and had our first child we realized one thing we should have taken into consideration - the difficulty of getting a baby in and out of the backseat of a 2 door vehicle. But we decided to put up with it, that it wasn't enough of a reason to purchase a new vehicle.Then as time went on the next pregnancy brought twins and we didn't see any way to be able to get 3 car seats in our little car. Although I never wanted to be a van guy, we switched to a nice family minivan, also taking into consideration that we wanted to have more children. It is so easy to get caught up in the flow of what everyone else is doing. It's easier in the moment to follow the crowd rather than doing what's best for you (assuming they may be 2 different things :) ). My mother-in-law's family has dinner together every Christmas, which ends up being a very large gathering, about 25 to 40 people. 5 years ago they decided to have a Secret Santa gift exchange to make it a little more fun for everyone. We were okay with the extra purchases, even as our family grew in numbers, which would increase our gift purchases (each family member is assigned someone else to give a gift to) - we're up to 7 now...)We could find a way to keep cost low since most of the children we had to buy for are under age 7 (dollar stores fills that ticket easily with some nice, budget items). So recently, my daughter's tooth came out, right in the middle of class (Grade 1) on the second day of school. Everyone wanted to see it. They were probably just curious about it, since most of them haven't lost a single tooth yet. They were also probably too young to look at the tooth and see a golden nugget. After all, we all know that teeth are like gold because the tooth fairy will exchange lost teeth for coins while you sleep. She got her magical $1, then not a week later... #2 came out and another $1 came. We've been trying to teach our kids, at a very young age, about proper money management. We give our oldest daughter (age 5) an allowance; $1/week. We sat down with 10 dimes and explained what happens with her $1/week. Its a new school year. Among other things, college students around the world will be bombarded with credit card applications, offering instant credit. It feels like free money. Low introductory rates make us feel like we earned some bonus money by being accepted to our prestigious institution. Its not until months/years down the road that the real pressure comes to bear. Once those introductory rates disappear the debt will still be there and will start to crush you. Futureshop and Circuit City are the adult candy stores of today. For many people (mostly male) who walk into these stores, our eyes widen with excitement... I find myself asking "Which items most badly want to come home with me?" So many new toys, gadgets and .. oh ya, they cost money... lots of money. But surely my pleasure and bragging rights will compensate for the high price, right? Maybe for a few days, but then you have to face the bill, or the other need that you now cannot afford. I find when I go into those stores, I go with a purpose and item in mind, and go directly to that item and then make my purchase and leave. Otherwise, the temptation can be too great :). Every time I buy diapers for my baby or any everyday purchase, I accumulate points that will eventually get me a free movie ticket. (thanks to Scene.ca) On top of that, one of the department stores I purchase the baby items from also has it's own point system which again I use to buy things out of their points catalog. My mother-in-law was recently surprised to see that she had accumulated a large number of points that she then redeemed for a $130 gift card. She used it to purchase clothing for her new job and a birthday gift for our daughter. I have redeemed my gas station points periodically for a car wash. You do have to be careful to keep the use of your points cards current. A few years ago I hadn't used one of my department store points card for a while, the department store put it in dormant state and I lost the points that were on there. I used to be a McDonalds junkie. According to the video "Super Size Me", McDonalds would have considered me a heavy-consumer, frequenting a McDonalds restaurant more than 3 times a month. Fortunately for my budget (and health!) I've reduced my eating out habit to almost nil. One of the most common budget-breakers is eating out too often. This occurs for a number of reasons. We make ourselves so busy, we can't (or won't) find the time to prepare a quality meal. We don't grocery shop and meal plan very well so we end up with lots of the same thing night after night. Eventually we get same-meal fatigue and want to eat-out for variety. We are either too tired or lazy to prepare a meal. Even if we have the time, we'd rather watch TV, or do a myriad of other things. The above graph shows dollars spent on eating out (in Canada) over a number of years. Clearly the trend has been increasing. Judge for yourself where you stand. Because I've been using CalendarBudget to track my finances since 2002, I can calculate exactly how much I would have saved by not eating at McDonalds ... a whoping $965.82! If I had invested this money, it would be worth almost $2000 today. How much money would you save if you didn't eat out so often? Last year, an unexpected complication happened in my wife's pregnancy which ended up with her hospitalized for 2.5 months and I had to take an unpaid leave from work to care for my other children. That left us with no income, living off our savings for that time. Luckily it all turned out well in the end, but while it was happening, we were fortunate to not have to worry much about the finances, because we'd heeded counsel to have a "rainy day" or emergency fund. We kept about $4000 in this account, which we had saved over a period of a few years, along with our regular retirement savings. Can I afford to work for myself? Good question. Having just grappled with this, let me share some pointers. Being an entrepreneur, especially starting out, is challenging. Much has been written about startups. This blog entry is about how to afford it. Chances are you are a bright, self-moivated individual, working for some large corporation or a mid-sized company, earning a reliable paycheck, but frustrated. You are frustrated because you don't have enough time to focus on your own business ideas and you just can't build momentum with your full-time job taking so much time. Furthermore, you are noticing that management in your full-time job are not as competent as you once thought and this too is frustrating you, making you start to dislike your job. If you have extra money, reducing your debt is a great idea for several reasons. You never know if interest rates will go up and thus your mortgage payments may become unmanageable. Having no debt is one of the nicest, freest feelings available. You will be much happier. A short, 4 minute video describing CalendarBudget's features has been posted and is available from the main CalendarBudget homepage. I was excited to hear recently, that with my modest savings of $65,000, that I'll have 1 million dollars in 36 years (without saving anything else). Thank you compound interest and the rule of 72! For those needing a refresher on the rule of 72 (or if you've never heard of it), it goes like this. Take the interest rate you are getting on your savings (investment) and divide it into 72. The result is the number of years it takes for your money to double in size. In my case I estimate 8% (I estimate low for my interest rate - probably it will be between 8%-12%). So this gives me 72/8=9. So, my money doulbes every 9 years, untouched. Interest rates recently went up again, and are expected to go up again next quarter. Studies show that people are living so tight with their money, that if interest went up 1 full percent, 25% of people would lose their home. Canadian interest rates recently went up again, and are expected to go up again next quarter. Studies show that people are living so tight with their money, that if interest rates went up 1 full percent, 25% of people would lose their home. That is a scary thought and makes me wonder how close I am to that outcome; how close is my extended family. Will they expect help from me if their personal finances go downhill and if so, what strain will that put on me and my family?